On Nov. 3, a New York subway train struck two MTA transit workers, killing one and injuring the other while they worked on the tracks. With this accident, it raises the question of what safety procedures does the MTA have in place for track workers? At the time of the accident, the workers were setting up warning lights for a construction zone when a G train came around a curve and pinned them against the tunnel wall, according to the New York Times. As a result, one worker died and the other was seriously injured, according to the NYT. This track worker-train accident was the first since 2013 and the 13th fatality among transit workers in the past 15 years, according to ABC 7 News. This accident highlights the extreme danger that transit workers are in every time they step on the tracks. However, if track workers know what safeguards are in place can help to protect them when they are working in the city’s dark subway tunnels. Here are a few. Transit workers stepping on the tracks without checking both directions was the most common cause of fatal accidents to track workers, according to the NY Daily News. Track workers should expect the movement of trains at any time, on any track, in either direction, according to the Federal Transit Administration. Track workers should look both ways before crossing tracks and take the shortest route if possible. If a worker is crossing more than one track, stop and look both ways before crossing each track, according to the FTA. Track workers who hear that a train is proceeding to their location, can shout out “Clear Up” to alert any other workers that may be on the track. “Clear up” is a call to get in a protected position that will let a train pass by you safely. When someone calls out “clear up,” there are two safe positions for a track worker to stand. One safe position is the tunnel’s catwalk and the other is standing in shallow niches in tunnel walls or in columns between separate sets of tracks, according to the NYT. All track workers who are working on a track must carry an approved flashlight or lamp to illuminate their work area, according to the Transportation Research Board, an organization that provides public officials, information and research on transportation challenges of the 21st Century. These lights should be high intensity incandescent or LED powered. Flashlights and lamps help to protect a worker from tripping and falling when walking through the dark subway tunnel. These lights can also be used to flag a train proceeding into an area where there are track workers. Flagging the train down will give it time to stop and allow the track workers to get themselves and their work materiel out of the way, according to the TRB. Track workers who are working around the energized third rail need to be very careful in order to not be electrocuted. The NYC subway third rail requires 600 volts for trains to operate and can prove fatal if touched, according to the MTA. 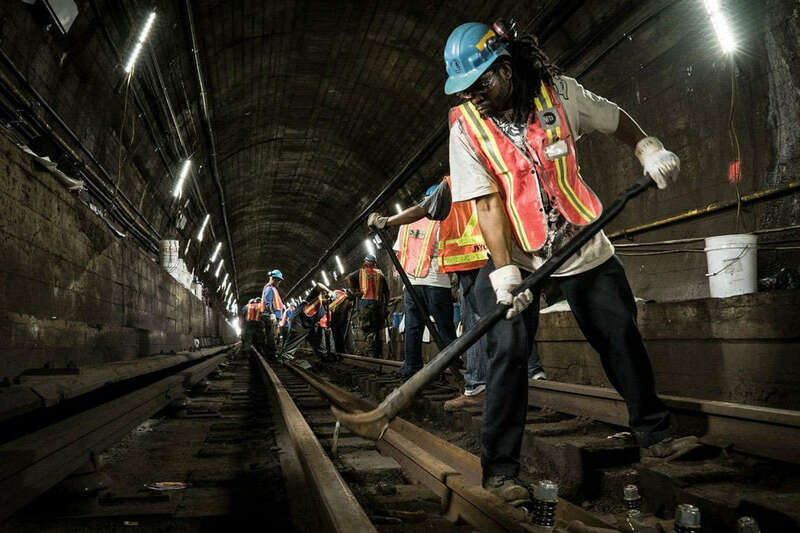 Track workers who are working around the energized third rail are required to use plenty of a quarter-inch, 3-feet wide rubber mats to cover the third rail in the work area, according to the TRB. Workers can use as much mats as needed, but must make sure that there is a minimum of 1-foot overlap between mats. Also all metal tools that are used in the vicinity of the third rail must be properly insulated with rubber or electrical tape, according to the TRB. It’s not just rail workers who might get injured while working, though. If you are injured on the job and your worker’s compensation benefits has been denied, we can help. Read more to learn what our attorneys can do for you. If you are ready to file a claim, fill out our free, no-risk case evaluation form today.